Clarke won’t find much sanctuary in Sanctum. 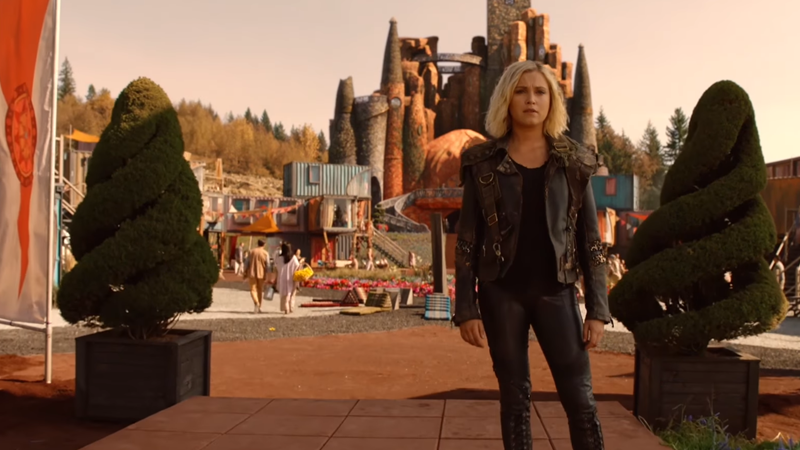 The CW has just dropped the first major look at how The 100 is planning to move on from the 125-year time-skip it took at the end of its fifth season, which saw the survivors leave their homeworld after a second nuclear hellfire threatened to wipe them out for good, and more ridiculous fighting caused them to destroy the last habitable land. They took a long, cryo-sleep-aided rest, which turned into an unexpected trip out into space in hopes of finding a home. Good news! They found a new home (very unsubtly named Sanctum). Bad news! If that was it, there would be no need for The 100 season six—and so everything on said new home is about to go very, very wrong. This trailer drops the pretense that Clarke and the others have found paradise pretty quickly—see: the double-eclipse-induced psychosis that drives Sanctum’s residents into bloodthirsty rages, and the creepy-looking hunters in gnarly irradiated armor stalking the woods. But hey, at least it means The 100 is free to carry on putting all these characters through hell for another season at least! The 100 returns April 30 to the CW.